If you are looking for a compact car, you expect to save money on your purchase. You can do that and get maximum value with the 2018 KIA Forte. Here’s a comparison between the Forte and its competitor, the Honda Civic. With a starting MSRP of almost $2,000 less than the comparable Civic, the Forte saves you money up front. KIA keeps saving you money with good fuel economy (29 mpg city and 37 mpg highway). This generation of Fortes has earned a remarkable four out of five from JD Power, indicating reliability and durability. Over the life of the car, you can count on KIA warranties for peace of mind. Your Forte purchase will entitle you to five years of roadside coverage and a five-year limited warranty. Honda limited warranties end three years after purchase. Furthermore KIA’s powertrain warranty runs for up to 100,000 miles or ten years, the best in the business. Honda has the typical five-year coverage. The Forte has similar horsepower to the Civic. Both offer manual editions, and Honda has a continuously variable transmission while KIA sticks with a more familiar six-speed automatic. Fortes have a tighter turning circle than the Civic, giving the Kia an advantage in terms of maneuverability. The 2018 KIA Forte cabin has more soft-touch materials than its rival Civic, and U.S. News and World Report has written that the car’s interior quality is hard to beat. Shoppers will find the Forte has roomy accommodations and a big trunk to match the Civic’s. While critics complain that the Honda infotainment system is hard to use, the same critics praise KIA’s system as one of the most user-friendly. Both automakers are offering touchscreen technology with Apple CarPlay and Android Auto as standard fare. This special connectivity allows you to access more apps, including navigational aids. For those who are saving money by not buying a GPS navigation system, map apps are an effective alternative. The 2018 KIA Forte has a five-star federal rating. This indicates good crash scores and suggests that the Forte is ready to keep you and your passengers safe. It has also earned the 2018 Top Safety Pick Plus Award from the Insurance Institute for Highway Safety. In those crash tests, it earned good scores, and KIA crash avoidance systems were rated favorably. The Civic earned similar scores, but its headlights were deemed inadequate, and it was not named a Top Safety Pick. Come check out the cushy cabin, the many trim levels, and the sedan or hatchback style. 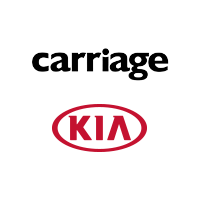 You are sure to find a 2018 KIA Forte that’s right for your budget and your lifestyle at Carriage Kia of Woodstock.